Childline visited school to give an assembly on 11th November 2015. This focussed on the types of things that children often worry about. 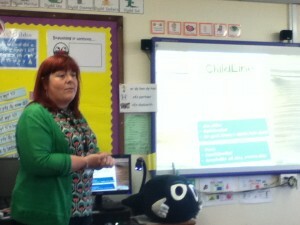 Fiona talked about ‘The Big Bag of Worries’. Follow up activities were held in the classroom the following week where the children discussed who they could talk to if they were worried about anything. Issues discussed included different forms of abuse, neglect, bullying and cyberbullying. The pupils all listened well and contributed to group discussions.